The Mechanics Institute of Victoria Plaque at the Maldon Athenaeum Library was erected during the 150th anniversary celebrations of the discovery of gold at Maldon in 1853. 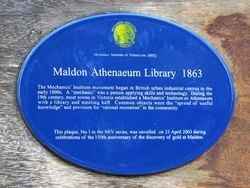 The Maldon Athenaeum was established in 1863 on the worldwide principles of the Mechanics’ Institutes Movement that was popular at the time. In December 1853, gold was discovered at Cairn Curran (the name given to one of the sheep runs), and Maldon became a part of the Victorian Gold Rush. The goldfield, which was named "Tarrangower Fields" after Mount Tarrangower, immediately attracted an immense number of men eager to make their fortunes at the diggings. Just one month after gold was first discovered, the Chief Commissioner for Goldfields reported 3000 miners had arrived at the diggings. A month after that, a journalist for The Argus reported that the road from Castlemaine to Maldon was lined with the shops of people hoping to make a living of their own from the miners. The Mechanics` Institute movement began in British urban industrial centres in the early 1800s. A 'mechanic" was a person applying skills and technology. 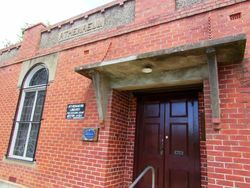 During the 19th century, most towns in Victoria established a Mechanics` Institute or Athenaeum with a library and meeting hall. Common objects were the "spread of useful knowledge" and provision of "rational recreation" in the community. This plaque, No.1 in the MIV series, was unveiled on 21 April 2003 during celebrations of the 150th anniversary of the discovery of gold at Maldon.